Composing effective tweets for your business is important, and the best way to learn is by example. The key is to find accounts that have perfected the art of short, sweet, and to-the-point tweets. We've compiled a list of the top 50 Twitter accounts (including links to the accounts -- woohoo, easy for you!) 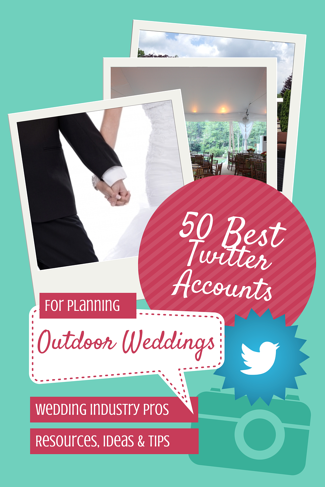 for outdoor wedding planning to inspire more effective tweets about new wedding trends and ideas. The list includes professionals in every category from DIY themes to air conditioned tents for outdoor weddings and offers insight, helpful tips and news from all aspects of the industry. Take a look at this list and you’re sure to find a few new Twitter accounts to follow and connect with. Just click on the hyperlinked Twitter handle and a new window will open where you can find out more about the company and choose to follow. The Knot @theknot -- The girls from The Knot who eat, sleep and breathe weddings. Weddings Unveiled @WUeditor -- Updates and tips from Weddings Unveiled Magazine. Wedding Market @weddingmarket -- Global news, trends & marketing information for the wedding industry. Event Engineer @planningforever -- Event/wedding engineer. Style Me Pretty @stylemepretty -- An account that brings chic, stylish weddings to the masses. bridalguidemag @bridalguidemag -- They have all the How-To-for-I-Do you can handle. WeddingChannel @WeddingChannel -- Tweets from the Wedding Channel editors on the perfect dress to celebrity engagements. BrokeAssBride / Dana @BrokeAssBride -- A blog for the bride with a budget. Ruffled @ruffledblog -- A wedding blog for DIY brides and creative couples. Onewed @onewed -- OneWed makes wedding planning smart & simple with an imaginative approach to your journey down the aisle. Endless bridal style eye candy & inspiration awaits. Weddingchicks @weddingchicks -- A go-to website for wedding inspiration, style, DIY, tons of clever ideas and much more. Home of the Bouquet Recipe and free printables galore. Event Magazine @Eventmagazine -- Event magazine is the leading publication for the event industry. Southern Weddings @iloveswmag -- The South's freshest wedding magazine and blog. Preston Bailey @prestonrbailey -- An event designer and artist. BizBash @BizBash -- Ideas, news, and resources for event planners & experiential marketers. Christine Dyer @BridalTweet -- Follow them to find the hottest wedding vendors. Event Planners Assoc @EPAcommunity -- Empowers business owners in the event industries through their professional business support, education, and connection opportunities. MarthaStewartWedding @MarthaWeddings -- Ideas, inspiration, and the inside scoop from the editors of Martha Stewart Weddings. Kristin Banta Events @KristinBanta -- Event Solutions 2014 Planner of the Year - event and wedding Planner and TV personality who pushes traditional boundaries and the expected. The Knotty Bride @theknottybride -- Tips, DIY ideas, and mistakes to avoid. Loverly @loverly -- The search engine for weddings. Wedding Wire @WeddingWire -- The most trusted online resource to help make the wedding-planning process easy and fun. Revelry Event Design @RevelryDesign -- An exceptional visionary team, known as LA’s go to event and interior design company, specializing in event design and installations. David Tutera @DavidTutera -- Celebrity wedding and party planner, TV host, author, and professional speaker. Junebug Weddings @junebugweddings -- A trusted wedding planning resource, online magazine and inspirational blog. Colin Cowie Weddings @ColinWeddings -- Fabulous weddings for everyone - ideas, tips, inspiration, and more from the editors. Leila Lewis @weddingPR -- Wedding PR consultant and blogger - helping wedding brands with press, promotion, and business coaching. Utterly Engaged Mag @UtterlyEngaged -- The first online wedding magazine. District Weddings @DistrictWedding -- A daily indulgence for the DC couple, including the latest trends and wedding ideas. Washingtonian B&G @WashBrideGroom -- Washington DC wedding inspiration from your friends at Washingtonian Bride & Groom magazine. Rosemont Manor @Rosemont1811 -- A haven for US Presidents and Washington elites for 200 years. Northern VA’s premier destination wedding location. WeddingInstitute @WedInstitute -- WEI specializes in courses for wedding planners, party planners, corporate event planners, wedding stylists and event designers. Wedding Halls @WeddingHalls -- Looking for Wedding Vendors? Get competitive proposals from local wedding professionals. Wedding Items @weddingitems1 -- Helping brides connect to suppliers and helping wedding suppliers connect to brides. Project Wedding @ProjectWedding -- Project Wedding is the exclusive wedding resource where couples find all of the inspiration to plan their wedding. Free wedding websites, vendor reviews, and more. Jen Campbell @grnweddingshoes -- Fashion and photo inspiration for your wedding. TheWeddingPlannerMag @CvlWeddingPlan -- A step by step guide to your perfect wedding. BRIDES @brides -- Endless inspiration for your wedding day and beyond. DIY Weddings Mag @DIYWeddingsMag -- A wedding magazine written and created by brides for brides. Sarah Pease @BeBrilliantNYC -- Official twitter of The Proposal Planner and expert on dream marriage proposals and fantasy weddings. Lindsay Pitt @TOAST_events -- Orchestrator of weddings and social celebrations. Keswick Hall @Keswick_Hall -- Keswick Hall is located in the heart of Virginia hunt country, close to historic Charlottesville and only minutes from Thomas Jefferson's historic Monticello. Lynn Easton @EastonEvents -- Wedding designer and planner. Pippin Hill Farm @PippinHillFarm -- Pippin Hill Farm is a family owned winery & vineyard, committed to sustainable viticulture and a passion for innovative and quality Virginia wines. Occasions @OccasionsMag -- Helping You Celebrate in Style. Weddings, Parties, Celebrations, Entertaining & Holidays. Kate Headley @kateheadleydc -- Named a top wedding photographer by Martha Stewart Weddings. Inside Weddings @InsideWeddings -- The insider's guide to weddings with style. Trump Winery @trumpwinery -- A winery and vineyard in beautiful Charlottesville, VA.
a Dream Wedding @WeddingCatcher -- The name says it all. AirPac - Tina @AirPacInc -- Yup, that's us! We're here to keep your outdoor wedding safe, comfortable and memorable for all the right reasons because Mother Nature is ALWAYS on the guest list! Following accounts that create informative and engaging tweets about the wedding industry also benefits you as your newsfeed becomes full of useful content for your followers and hopefully, new clients! The wedding industry is a very visual community so inserting links into your tweets will give your followers a more in-depth look at your idea or event and is also a great way to generate traffic to your website. So many great resources are available with just a click. Any Twitter accounts you think should be added to the list? We’d love to know some of your favorite outdoor wedding planning resources. Please comment below with and let us know.